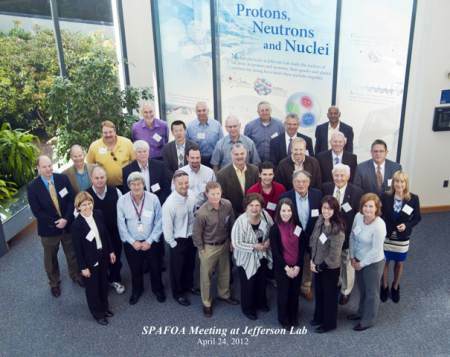 Jefferson Lab Hosts Spring 2012 SPAFOA Members Meeting - Meyer Tool & Mfg. There was a big turn-out for SPAFOA’s second members’ meeting of 2012. Hosted by Jefferson Lab, the meetings and tours of the 12GeV upgrade facilities, industry/Lab round table were another great event put together by SPAFOA to foster industry-national laboratory collaboration. Meyer Tool & Mfg., Inc. attended the Superconducting Particle Accelerator Forum of the Americas (SPAFOA) Spring 2012 Members meeting held at Jefferson Laboratory, on April 24, 2012. The second of four planned meetings for 2012, Ken Olsen of SPAFOA and Anne McEwen of Jefferson Lab did a fantastic job organizing speakers with presentations filled with information useful to member companies, all key suppliers in accelerator technologies. The meeting was attended by 25 industry representatives, from 15 SPAFOA member companies. An almost equal number of Jefferson Lab employees, 23 attended. This included representatives from Jefferson Lab’s administrative, procurement and technical divisions including Accelerator, Cryogenics and SRF. The day’s agenda included a variety of talks, including the current status of the SPAFOA forum and the SCF Program at Jefferson Lab, a facility tour, and an informal round table discussion of issues that impact the laboratory and industry. Only a brief summary of each of the presentation will follow as the actual presentations are all linked to the speaker’s name. Photos from the day can be found on Meyer Tool’s Facebook page. The meeting was started with a welcome from Dr. Hugh Montgomery, the Laboratory Director. Appointed in April of 2008, Dr. Montgomery is Jefferson Lab’s third director since its founding in 1979. Jefferson Lab is a DOE basic nuclear physics research laboratory with a world-wide user base. Its primary mission is to conduct basic research of the atom's nucleus at the quark level. Partnering with industry, universities and defense agencies, Jefferson Lab also pursues applied research with its free-electron laser and medical imaging programs. Jefferson Lab sees one of its key responsibilities as educating the next generation in science and technology. Tony Favale, Advanced Energy Systems, Inc. and SPAFOA Chairman, stood in for Ken Olsen, SPAFOA President, as he discussed the mission and status of the Forum. Founded in 2005 the Forum has grown into an important resource for SRF related industrial policy and has worked hard to fulfill its mission of promoting the industrialization of superconducting radio frequency technology in the United States and Canada. The future directions of the SRF program at Jefferson Lab was presented by the Associate Director, Accelerators, Andrew Hutton. The Accelerator Group’s mission is to advance the capabilities of Jefferson Lab to carry out world-class nuclear science and develop the expertise and technologies associated with high power superconducting linacs. Hutton discussed current activities and future plans that will support that mission. These plans included utilizing cutting edge technology to support new scientific endeavors. Those of us involved in Industry and the Laboratories understand the underlining importance of these projects to the health and growth of our nation and the world. Support of organizations like SPAFOA is key to making this message heard in Washington, where the funding decisions are made. Always of interest to SPAFOA members are the purchasing and procurement practices and opportunities for partnerships or technology transfer at a particular Laboratory. Roy Whitney and Teresa Danforth presented on these topics. Jefferson Lab has an aggressive technology transfer program and utilizes three main vehicles for technology transfer, Cooperative Research and Development Agreements (CRADA), Work for Others (WFO), and Memorandum of Understanding (MOU). They also license Laboratory intellectual property to industry. The procurement process is executed on a competitive basis using either purchase orders (for projects valued less than $150,000) or subcontracts. As part of the 12GeV upgrade and utilizing monies from the American Reinvestment and Recovery Act (ARRA), a new SRF building, the Technology and Engineering Development Facility (TEDF) is being constructed at Jefferson Lab. Charlie Reece and Tony Reilly presented the information on this new facility and how the modern infrastructure will enhance the capabilities and productivity of Jefferson Lab’s SRF program. Rao Ganni, a Fellow of the Cryogenic Society of America, discussed the implementation of the Ganni Cycle, and the 12GeV upgrade Cryogenic System. This implementation involves utilizing industry equipment coupled with Jefferson Lab process and control advances to improve the efficiently and energy consumption of the 4.5K Helium System at the Laboratory. The final presentation of the morning looked to the future and how the new TEDF infrastructure will present new opportunities for Laboratory and Industry interaction. Bob Rimmer and Joe Scarcello affirmed Jefferson Lab’s commitment to taking the lead on SRF R&D and implementation, maintaining critical Cryomodule integration capability for the DOE, educating and training for the future, and finally enhancing opportunities for industry involvement. We were also led on tours of the TEDF building JLAB Accelerator, CHL2, FEL, and SRF Facilities. Photos are posted to our Facebook page. The final event of the day, moderated by Ed Bonnema, Meyer Tool and SPAFOA Board member, and joined in by Ken Olsen via phone, was a informal free-form discussion of topics of interest to industry and the laboratory. One of the topics was of concern from industry on the use of reverse auction sites for purchase order contracts. SPAFOA members companies are highly invested in technology and experts in their fields. The use of these venues ignores the huge value added this knowledge base can provide in providing the lowest total cost of ownership to the laboratories rather the lowest first cost. At this time the Jefferson Lab is using the sites but is not tracking the quality or hidden costs of using low bidders without technical evaluations of offers. This is a large concern to many SPAFOA members. Jefferson Lab reaffirmed its commitment to the industry and the many individuals invested in its future by hosting SPAFOA’s Spring Members meeting. It is only through this collaborative spirit that SPAFOA’s mission to promote the industrialization of SCRF technology within the United States can be achieved. From achieving optimized design and construction goals to fully engaging users focused on science and the resulting discoveries sure to ensue, Jefferson Lab is expressing commitment to values similar to those that drive Meyer Tool daily: from a project’s inception, we strive to Reduce Project Risk in order to achieve the lowest total cost of ownership for our customers. We are grateful for the informative day provided to us by Jefferson Lab and thank SPAFOA for bringing us together for yet another interesting day!